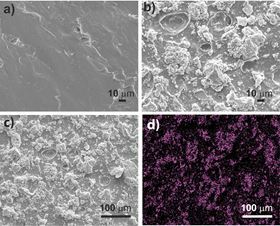 Scanning electron microscope images of: (a) the chitosan film; (b) the chitosan-copper MOF film at 500x magnification; (c) the chitosan-copper MOF film at a higher magnification; and (d) an X-ray image of the film that shows the copper in pink. Images: Reynolds Lab/Colorado State University. By some estimates, bacterial strains resistant to antibiotics – so-called superbugs – will cause more deaths than cancer by 2050. Biomedical and chemistry researchers at Colorado State University are using creative tactics to subvert these superbugs and their mechanisms of invasion. In particular, they're devising new ways to keep harmful bacteria from forming sticky matrices called biofilms – and doing it without antibiotic drugs. Researchers from the laboratory of Melissa Reynolds, associate professor of chemistry and the School of Biomedical Engineering, have created a new material that inhibits biofilm formation by the virulent superbug Pseudomonas aeruginosa. Their material, described in a paper in Advanced Functional Materials, could form the basis for a new kind of antibacterial surface that prevents infections and reduces reliance on antibiotics. Bella Neufeld, first author of the paper and a graduate student who led the research, explained that her passion for finding new ways to fight superbugs is motivated by how adaptive and impenetrable they are, especially when they are allowed to form biofilms. "Biofilms are nasty once they form, and incredibly difficult to get rid of," Neufeld said. In a classic example, cystic fibrosis patients are made sick by hordes of P. aeruginosa bacteria forming a sticky film on the endothelial cells of the patients' lungs. Once those bacteria attach, drugs won't kill them. Or a wound can become infected with a bacterial biofilm, making it more difficult for the wound to heal. Reynolds' research group makes biocompatible devices and materials that resist infection and won't be rejected by the body. In this most recent work, they designed a material with inherent properties that mean it can prevent a bacterial film from forming in the first place. In the lab, they demonstrated an 85% reduction in P. aeruginosa biofilm adhesion, and conducted extensive studies showing the reusability of their film. This indicated that its antibacterial properties are driven by something inherent to the material, so its efficacy won't fade in a clinical setting. They used a material they've worked with before for other antimicrobial applications: a copper-based metal-organic framework (MOF) that's stable in water. They embedded this copper MOF within a matrix of chitosan, a material derived from the polysaccharide chitin, which makes up insect wings and shrimp shells. Chitosan is already widely used as a wound dressing and hemostatic agent. Neufeld says the new biomaterial could highlight new avenues for antibacterial surfaces. For example, the material could be used for a wound dressing made from the chitosan matrix rather than traditional gauze. This story is adapted from material from Colorado State University, with editorial changes made by Materials Today. The views expressed in this article do not necessarily represent those of Elsevier. Link to original source.